The B.K.M.O is a network of like minded individuals. 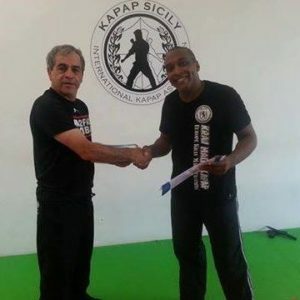 We are committed to self-development and self defence through Krav Maga. At any B.K.M.O school you will find professionals and career minded individuals working together to increase their knowledge and skill level. The B.K.M.O has the mission to provide a training networking that up holds an upstanding behaviour and standard of its members. Individuals who may spoil the enjoyment of others are not welcome with in a B.K.M.O club. The B.K.M.O did not set out to be different but it is obvious all organisations will have differences due to the people and culture with in the group. Martial Arts original meaning was the art of war. Martial arts is now mostly considered a sport and some self defence. The British Krav Maga organisation realises Krav Maga came from many Martial arts styles, whoever sole focus is self defence. We do not do Politics. The B.K.M.O will honour any Krav Maga Practitioners qualifications as long as grades can be verified. The B.K.M.O will train any competent Martial artist to teach a Krav Maga syllabus. The B.K.M.O will employ Krav Maga instructors on joint ventures and finance their start-ups in some special cases. The fact our interest is to grow personal protection through out the UK and Europe we have no time for politics. You will never hear a B.K.M.O instructor say that will not work. You will never hear a B.K.M.O instructor say they know it all. Krav Maga is a mixed system and it takes a degree of opened mindedness to put the syllabus together. If Imi Litchfield was open minded in his approach to develop the system we owe it to him to evolve with the times. © Copyright © 2013 Didsbury Black Belt Academy. All Rights Reserved.